By investing in the ability to control your smart devices from one central location, you can carry out your daily routine with considerably less effort. The technology in your home will work in harmony to help you save time and money, making your life as easy as can be. From automated security systems to home cinemas and smart lighting, JCL can help you achieve your dream home with our top quality range of products. We take pride in offering an outstanding service, tailored to your requirements. With first-rate knowledge and an enthusiastic approach, you can rest assured that you’re receiving only the finest service and superb advice along the way. Imagine being able to automate the curtains after you’ve climbed into bed, or having the TV or Radio turn on to your favourite station or maybe a fresh coffee ready before you get up. At JCL, your dream of living in a state-of-the-art Smart Home can become a reality. As well as being extremely energy efficient, home automation may also increase the value of your property and make it more appealing to potential buyers in the future. 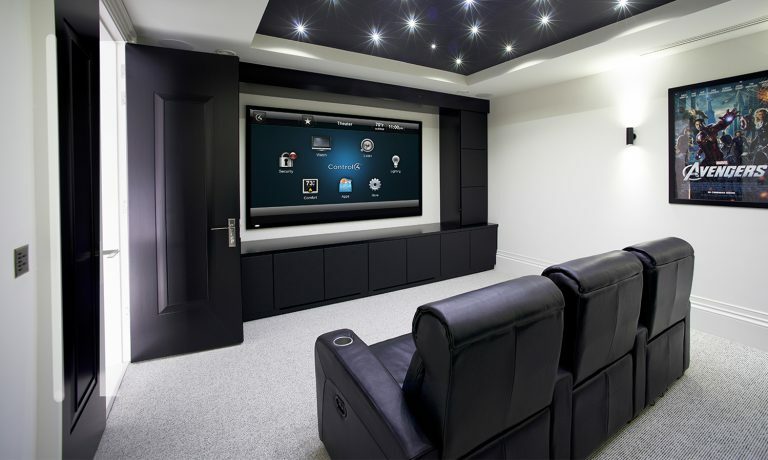 A home cinema system will allow you to spend quality time with your family with minimal effort. With one simple remote controller or touch of a button you will be able to dim the lights and start the DVD without moving from your seat. We can electronically file your music library or Video collection to playback in any room of the house. JCL offer a range of outstanding crime deterrents and security products, including excellent quality intruder alarms, sensors, entry control systems and high-tech surveillance cameras. We can also integrate to your existing Alarm system subject to compatible systems. The products available at JCL are manufactured by a variety of well-known, top of the range brands such as Control4 and Cisco. These manufacturers are trusted to provide long-lasting and superb quality technology so that customers can transform their homes with ease. Smart technology can also be applied to commercial properties, such as shops and offices. This reduces utility bills for business owners and allows them to check on their property, even when they are not on the premises. If peace of mind is what you are after, then you have come to the right place. If you would like more information or some knowledgeable advice, please don’t hesitate to get in touch. We have over 35 years of experience from within the Computer Digital Audio / Video, Home Automation and CCTV installation industries. With the convergence of IT methods and protocols our engineering background allows us to fully exploit the features and benefits the latest systems provide. Our strong IT and networking background helps us ensure we can provide reliable and robust home network solutions that are fundamental for any successful implementation, as this is the most important part of any smart home design. We are an authorised Dealer for many Video and Audio Products and Networking brands including, Cisco, IBM, HP, Control4 so we can install every aspect of this fantastic full home control system. We are based in Purley and Kingwood Surrey and cover homes and businesses within a 25-mile radius throughout the Home Counties and into areas of London. JCL Will provide all design networking and installation from the beginning of the project whether small or large our team will work with your existing builders or our own to insure all parts of the system are correctly fitted to satisfactory standards, and finally all support and ongoing concerns are covered on site or remote with management support. Our annual maintenance covers all parts and labour to all Smarthome systems provided. We believe all equipment that we provide will last for many years as you should expect, as only the highest quality products are used. Integrating innovative technology into your home will provide you with more ways to entertain your family, your guests and, of course, yourself. You can experience your favourite movie with a high definition screen or feel like you’re in the football stadium with quality surround sound. Either way, your free time will never be the same again.